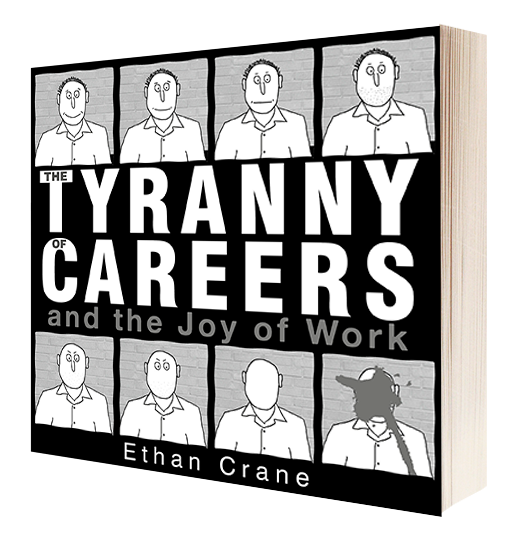 So today, the first of 2015, is publication day for The Tyranny of Careers. It’s been a long time coming – the friends who have been early readers of the book have probably lost faith that the work they put in would ever amount to anything. For anyone new to this blog: The Tyranny of Careers is the careers advice I wish I had received when younger – the advice that was not available then and seems very rarely given now. It is a product of the fact that, of the happiest adults I know, hardly any are those with full-time careers working for someone else – the stated goal of all the useless careers advice that I received. The book will, hopefully, provide comfort to both students and those already in full-time work – comfort about that niggling sense that a full-time career might not be the primary source of self-esteem and innovation it is held up to be by school, government and society in general. The reason being that, in my experience, it is not. Here’s the blurb that would appear on the back cover, if ebooks had back covers. More details about the book and how to buy it here. Or to see what it’s like you can download the whole introduction as a PDF. This is the subtext of every piece of careers advice I ever heard. It is advice I believed implicitly, that I believed for years as I bounced between highly-prized careers in television, film and publishing. Careers prevented me from wondering why the promised self-esteem was not forthcoming, burdened as I was by the stress and overwork that are common features of the work culture of almost every career. All I wanted was to do work where I felt my brain was not being wasted. But this only happened when I began to pursue work of my own. Unpaid, uncelebrated work. But work that felt valuable to me, that felt like it might contribute something of value to the work, even if that was way off in the future. My younger self needed don’t-chase-a-career advice. The Tyranny of Careers is this kind of book. Partly a memoir of my misplaced search for a career, and partly what I’ve learnt about work despite this: that it is possible to earn a living without a full-time career, whilst also pursuing work that is truly fulfilling. Why Write a Blog Post When You Have Nothing to Say? But what is the point? Why update a blog out of fear that no one will read your blog if you don’t? No one will read your blog if you don’t write with enthusiasm, either. I know this, but that does not rid me of the compulsion. I feel I ought to write something because, if anyone is interested in this blog — and there is no guarantee of that, even those who follow it might receive the email and delete it, even those who read it might have no interest in what they read, even those who read all the way through might forget what they have read a moment later — then the least they expect is regular content. But this is not a good use of writing time. Writing is pointless if you don’t enjoy the process. Are we struggling with writing in the hope that one day we might be able to make a living from this unenjoyable, pain-inducing activity? Posts must derive from notebook notes – in other words they must have started as an improvisation. The less forced, the more they come from a momentary enthusiasm, the better the writing. Posts must fit the theme of the blog – in my case, the tyranny of careers and the joy of work for yourself. Not just something interesting I saw today on the Internet on a different subject. When I read blogs I follow I want to know they will stick to their theme, which is the reason I follow them. (Sharing other things of interest can happen elsewhere. I like posting interesting things I find about the writing process, but that is not the subject here, and can go on tumblr. So then we have it. A post about the potential pointlessness of writing blog posts. Til (possibly much) later. Since the beginning of 2014 I’ve managed to keep a diary. 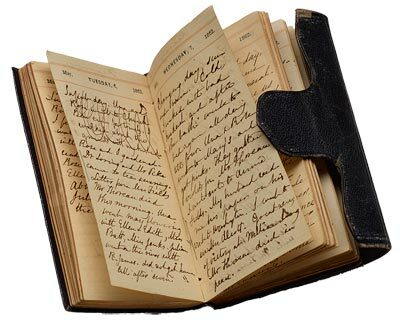 I’ve tried to keep a diary since the beginning of many other years – but the reason I never kept it up, I think, is that previously I did not really have much idea of what it was for. Not much idea and therefore little incentive. By mid-March this year I still did not really know what this diary was for, though had a little more idea. More importantly I had kept writing it, and tried out different formats. Partly I documented routine events, to see how they changed over time (a less visual paper version of data-mining your life), and partly I documented events that were meaningful to me, after reading this. But it was only when I read other people’s diaries (not furtively by rummaging through their bedrooms – published ones) that I saw what I really wanted a diary to be: practice for putting the events of the day into as clear a form as possible – that is, practice for writing. If a diary is a collection of meaningful events, then the act of writing them down is, like regular routine writing for yourself, honing the ability to put these meaningful events into words. It works differently from a notebook, which is noting things to remember, and more of an end-of-day routine, to clarify meaningful events, and the thoughts and ideas that derive from them, in as few words as possible. She keeps notes in a journal every day – she’s kept one since she was a kid – and then sits down with a guitar to “stick them all together into songs”. What is a book? Of what is it comprised? The best book is, I think, the distilled essence of the author – the collection of all the influences and meaningful events of the author’s life. Not always directly – not everyone writes a straight autobiography – but still a book that reflects these meaningful events and influences. And the existence of the internet allows us to collect and curate our influences and meaningful events in ways that we never could before. Before our frenzied online activity, reading/watching/taking in culture was an inefficient, piecemeal collecting of the works and events that had meaning to you – but now we can document them, collate them on a website, curate them. And turn them into a book. And because they can be documented so efficiently, this book can represent them more fully. That is the purpose of a Book, of the Book that we always try to write. I feel this to be true because other writers’ Books of Me are the books I most want to read – the filtered, analysed summaries of a writer’s collection of the meaningful events of their life. It is disconcerting – not to mention annoying – to read a book that confounds some of my most concrete beliefs, my most cherished prejudices. The perspectives on the world that I take for granted, to the extent that I no longer even think of them as prejudices, that I use as the foundation for small talk with friends. That perhaps even determine who my friends are – that is, people who share these unconscious prejudices. I’ve wanted to read Matt Ridley’s The Rational Optimist for some time (it’s about 4 years old now) because a) I’ve enjoyed his other books (mainly on evolution), and b) in a re-reading of a favourite book from my teens, Cosmic Trigger, the author Robert Anton Wilson points out the usefulness to the progression of our thinking in regularly reading points of view counter to your own. The Rational Optimist is not completely counter to my own views – but it is a very right-wing book, hailing the superiority of the market forces in, well, pretty much everything, and most of all citing trade as the prime reason for the improvement in mankind’s living standards throughout history. I have many issues with the idea that trade is a universal good that should be left completely alone for the good of society, but I don’t want to talk about that here. Because the stronger idea in the book is that pessimism, about the current and future states of the world, is a human disease that is counter to all the historical evidence – that by all measures you might think of: poverty, violence, human rights, human longevity, health, etc the human race has it better than ever before. But although we have it better than ever before, we refuse to see it that way, we ignore the evidence that doom-laden predictions of the past, about population explosion, virus epidemics, etc have not come to pass. There is much still to be fixed, and those of us in the developed world are fortunate to be in a position where we can celebrate these advances – but nevertheless, on average, things are better than ever before. And the reason is the constant desire of the human race for innovation, for finding new ways of doing things and exchanging these ideas. I have, in the past, been much of a pessimist, particularly on the environment. I’m not sure I even want to be an optimist – somehow it feels immoral. But I cannot help but feel Matt Ridley’s optimism has better evidence that our general pessimism. Another reason to want to disagree with the book was that I thought it countered my general themes in The Tyranny of Careers – by claiming that business and commerce are the drivers of society, when I’m doing all I can to suggest that a traditional career for a large company is the last place that you want to look to be make beneficial changes to society. But the idea of innovation as the driving force of humanity does not counter the ideas of The Tyranny of Careers. Because innovation, and the pleasure that being innovative, is what I (along with Matt Ridley) am claiming leads to work fulfilment and self-esteem. And although innovation on the part of one individual might lead to starting a business and trade, innovation is not all what happens when you work in a traditional career, when you work for a large company. Large companies are the graveyard of innovation. The chance to innovate was what was missing from all my traditional careers, is what made them so dull and unfulfilling places to work. I’m arguing that because innovation is so lacking in the traditional career for an employer, if we want to do fulfilling innovative work in the world we have to do it for ourselves, outside of paid work (at least in the beginning). You may end up working with many other people, you may end up using your innovation in a traditional-looking job. But if you are a graduate looking for fulfilment from work, you will not find the opportunity for innovation in a traditional career. When you tell colleagues you’re going to quit your job, you discover that most of them want to quit as well.